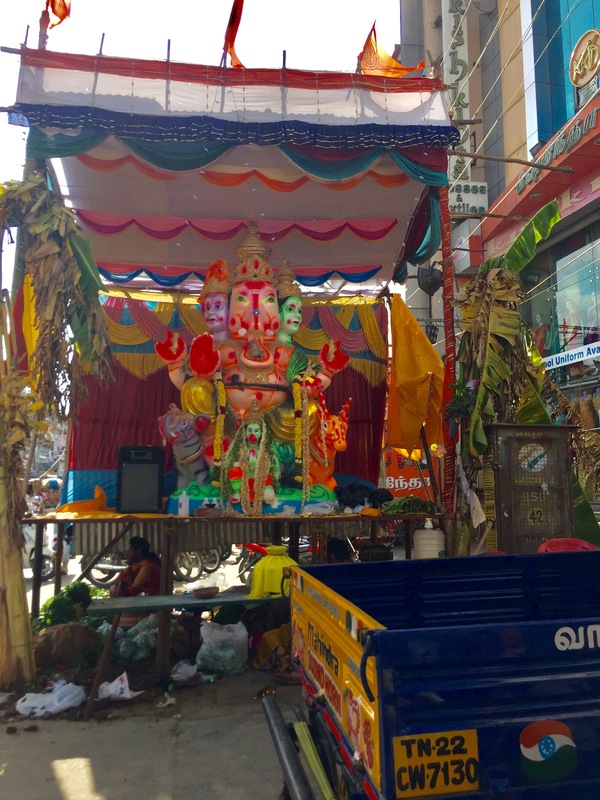 I saw my first Ganesh idol within the first hour of arriving to Chennai. A previously arranged bus picked us up from the airport, and even though it was dark, I was able to spot the first elephant god sculpture of my trip. Little did I know that this would be one of many shrines around the city dedicated to this deity around this time of year. After researching online, I found out that Ganesh Chaturthi is a Hindu festival that celebrates the birth of Ganesha, the “god of beginnings.” Also known as the “lord of the people,” Ganesha is known for removing obstacles and helping achieve success (I’m taking this as a sign that the semester in India will be a great one). 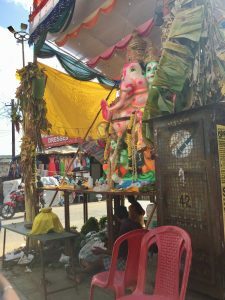 During the festival, which started the day before we arrived, families keep and worship an idol of Ganesh from two to twenty one days. It ends with the submersion of the idol into a body of water (I will revisit this practice towards the end of my post). 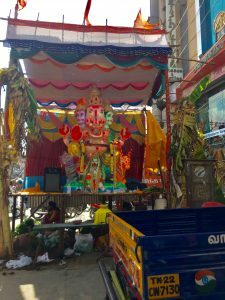 Even though we have only explored Tambaram twice, I have seen at least five sculptures of Ganesh. Some of them are huge and situated on the streets of the city, and other ones are small enough to fit inside stores. 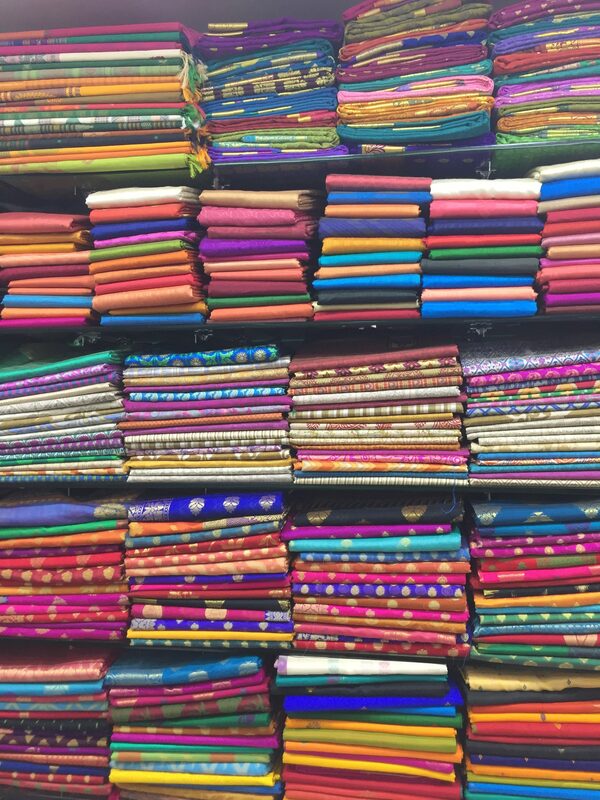 But they all have something in common, abundant decorations and lots of colors. 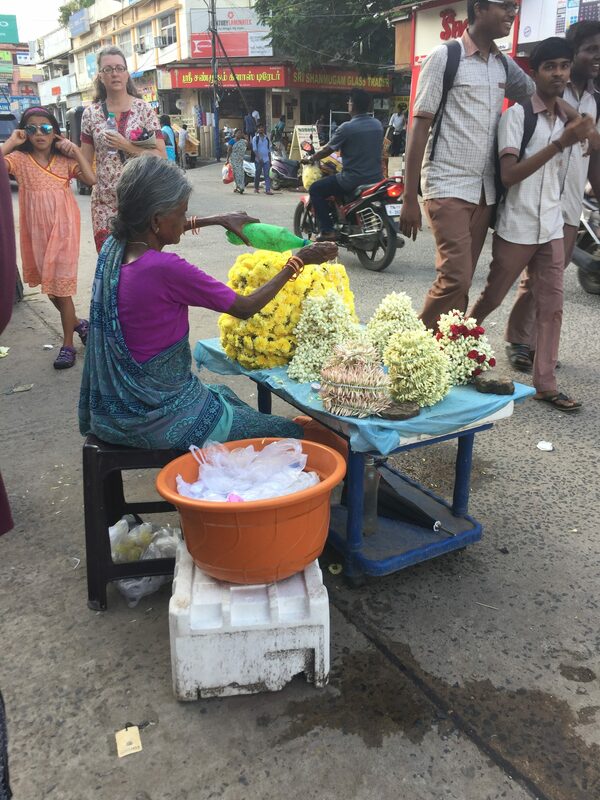 The amount of color in urban India is a notable distinction from the urban United States, at least in the little pockets of metropolitan Chennai that I’ve seen so far. 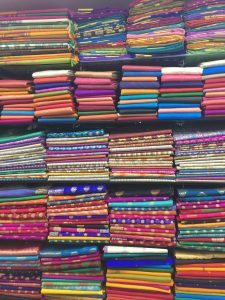 The bright colors not only stand out in the Ganesh shrines, but all over the streets in women’s clothing, fruit stands, flower stands, fabric shops, umbrellas covering shop stands, and even regular buildings. The neon green facade of the ‘New Mens Wear’ shop definitely caught my attention. 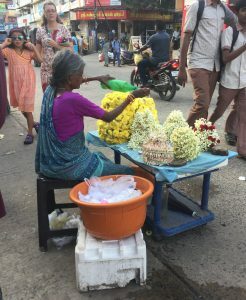 And even though I enjoy the aesthetic that all the color gives to the streets, I have also learned that there are some negative ecological aspects about the unique Ganesh idols. As a biology student in India with Davidson College, besides learning about India’s culture, I have also been studying its ecology, its biodiversity, and some of its differences in religious beliefs from the western world, mostly focusing on Hinduism. These beliefs cause some individuals to disregard pollution and dismiss sustainable practices. 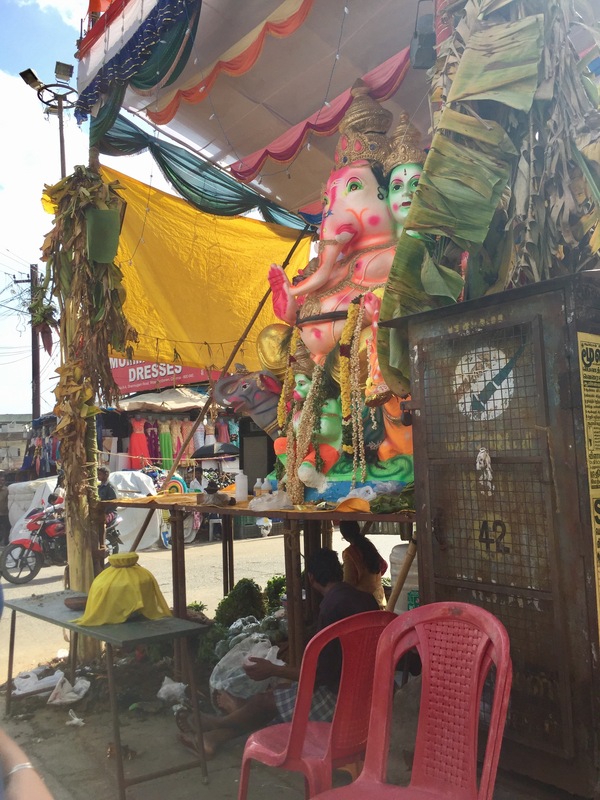 Unfortunately, the Ganesh idols are rarely made of biodegradable materials. This is concerning because, as I mentioned earlier, all the Ganesh figures are thrown into water when the festival ends. This practice leads to an increased pollution of the ocean, rivers, and lakes. Nevertheless, I am looking forward to traveling to Pondicherry on Wednesday, and learning about urban and ecological issues there as well as enjoying the tourist vibe. I wonder if we’ll run into any traces of Ganesh idols.